The Schlage Accent Lever with Camelot Trim Bed and Bath Lock in Satin Nickel is perfect for use on doors where locking is needed. The Accent lever is widely popular for its elegant wave-like design that effortlessly matches a room's style without overshadowing it, while the Camelot trim's scalloped architectural details make any room charming and approachable especially when wrapped in our versatile Satin Nickel finish. Plus, it's been designed and tested with strength and durability in mind. Prestige Alcott Satin Nickel Bed/Bath Door Knob Baldwin Hardware has a rich heritage of delivering modern luxury to discriminating homeowners. Baldwin Prestige Series offers effortless, accessible style and luxury. With the Baldwin Prestige Series, any homeowner can instantly create an atmosphere of confidence from the moment someone knocks on the door. Baldwin Prestige Series is affordable luxury. The Baldwin Prestige Alcott Knob features a classic-round traditional inspired design which is offered in keyed-entry, passage, privacy, and half dummy functions. Prestige Alcott Satin Nickel Bed/Bath Door Knob is rated 4.5 out of 5 by 13. Rated 5 out of 5 by Almaz from Excellent quality! As expected from Baldwin. Highly recommended. Excellent quality! As expected from Baldwin. Highly recommended. 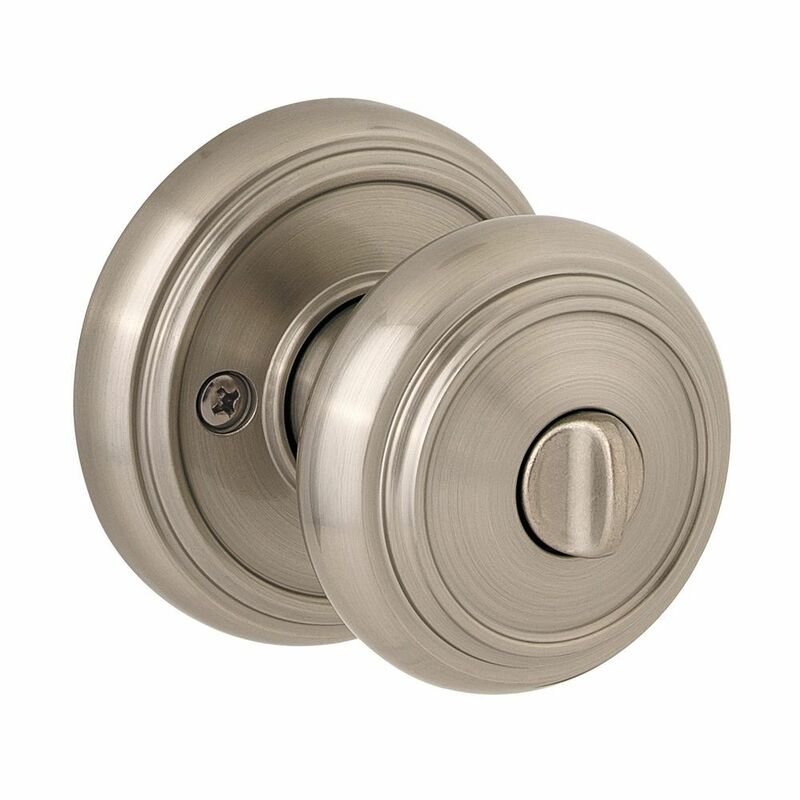 Rated 5 out of 5 by ST from After replacing all the house entry door locks with Baldwin,... After replacing all the house entry door locks with Baldwin, I've started replacing certain interior door knob sets with Baldwin. As with the entry lock sets, this interior set was a breeze to install, and has the same solid look and feel. Same as the entry door locks - Highly Recommended. Rated 5 out of 5 by Roger from Excellent size, design and weight for a doorknob. High quality.... Excellent size, design and weight for a doorknob. High quality. I will be replacing the older doorknobs in our house with this product. Rated 5 out of 5 by jmooser from Great knobs I have purchased multiple interior and exterior products from Baldwin, these knobs ar... Great knobs I have purchased multiple interior and exterior products from Baldwin, these knobs are easy to install and have a nice feel of quality. Rated 2 out of 5 by William from Knob feels cheap and light compared to earlier Baldwin knobs... Knob feels cheap and light compared to earlier Baldwin knobs I’ve purchased.